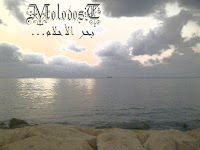 Molodost's second demo بحر الأحلام translates to 'The Sea of Dreams', and I think that's a pretty good handle for its calm and collected content, which lacks some of the obsessive madness of the Lebanese musician's prior Shades at Salvation Borders. While there are still a handful of black metal aesthetics present, the compositions here are largely rooted in simple, programmed drums and keyboard passages; maintaining a low budget feel, a very underdeveloped level of polish (which some with love and others loathe), and a sort of 'dungeon synth' vibe, only Raed's note selection and synthesized instrumentation is far brighter and friendlier than the formative works of, say, Mortiis or Burzum to fall under this category. Yes, this could definitely fall under the 'guy with a keyboard' or 'bedroom black metal' category, but it's not as if its creator has illusions about to the contrary, or to his own capabilities in terms of production and musicianship.